Veracity manufactures ground-breaking surveillance storage systems, industry-leading IP transmission devices, IP camera installation tools, an NTP time server and direct-to-storage products. We developed the world’s only storage system specifically designed for IP video surveillance data. We collaborate with the largest IP camera manufacturers and surveillance industry companies world-wide to develop innovative solutions. The greatest global environmental benefits are derived by the promotion and spread of innovative products which, at their core, are designed to be environmentally-friendly and efficient. These products make a positive statement about the service you provide, as well as saving your customer system-lifecycle expenditure and helping reduce the system's carbon footprint. A new addition to Veracity's industry-leading HIGHWIRE™ family, the HIGHWIRE Powerstar Quad (VHW-HWPS-C4) saves your customer system-lifecycle expenditure and helps reduce the system's carbon footprint. A 4-port EoC adaptor with an integrated PoE switch, the simple addition of this compact and stylish product to a single, legacy coax, now enables the installer to design even greater coverage and security for their customer by connecting up to 4 cameras, or PoE/non-PoE devices. This connect-and-go installation requires no configuration: with typically 25W of PoE available to use, simply calculate the required power budget for the new devices, connect and instantly confirm connectivity and status-at-a-glance by using Veracity's SafeView™ display. 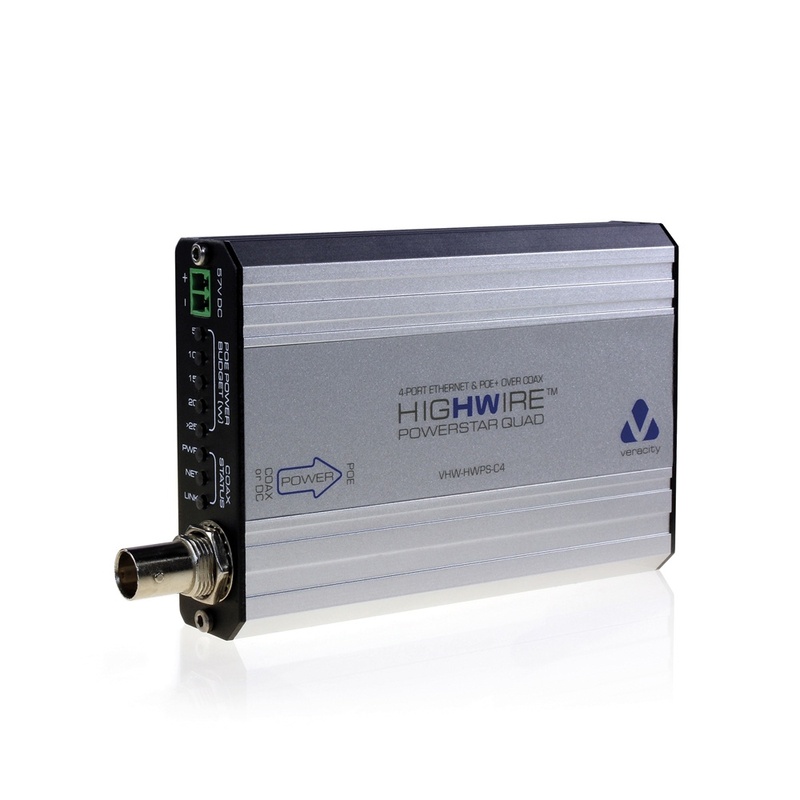 HIGHWIRE Powerstar Quad delivers 100BaseT-TX Ethernet up to 350m over RG-59 (500m RG-6) - greater distances can be achieved by utilizing an additional 100m of standard Ethernet connection on either side of the devices. By eliminating costly reduction through the use of legacy coax, more of your customer's budget can then be allocated towards using the latest IP cameras and improving their security, while at the same time reducing the impact on the environment. Within any rail, metro or industrial environment, the use of coaxial cable is always a safe bet when positioning remotely-placed CCTV infrastructure within a network that is required to operate consistently and effectively in harsh, extreme conditions. Veracity's HIGHWIRE Longstar™ now provides specifiers, integrators and end-users with a market-leading solution that enables cost-effective upgrades from analogue to the latest IP cameras and devices for long-range Ethernet over Coax, where any downtime for upgrades will often be balanced against commuter schedules. Reaching distances of over 1400m using RG11, Longstar delivers a full, unrestricted 100BaseT and PoE and is ruggedized to operate in extreme temperatures (-40 degrees to 70 degrees Celsius). Alternatively, if you need to send data only, Longstar will deliver 10BaseT, without PoE, over an impressive 4.2km (2.5miles), ideal for those long, dark tunnels. The pair of HIGHWIRE Longstar devices will self-configure, self-diagnose and self-optimize on connection, providing instant confirmation of their link status and power level. HIGHWIRE Longstar is BS EN 50121-4 compliant, ensuring that its installation will cope with the challenging conditions of any rail or metro property estate. Inside all but the largest buildings, networked devices can be connected without much concern for the 100m limit of Ethernet over network cabling. However, problems arise in larger buildings or when the IP devices have to be played externally, usually more than 100m from the nearest network switch. Common examples include IP cameras, VOIP phones and access control. Fiber is a solution, but it cannot support PoE, and providing separate power spurs increases the overall installation cost. LONGSPAN has been designed to connect and power IP cameras and other networked devices at distances of up to 820m on CAT6, supporting full 100BASE-T Ethernet and 802.3 at PoE. This long-distance performance and PoE power delivery allows the system installer to place IP devices almost anywhere, delivering 25watts at 600m and 15watts at 820m. 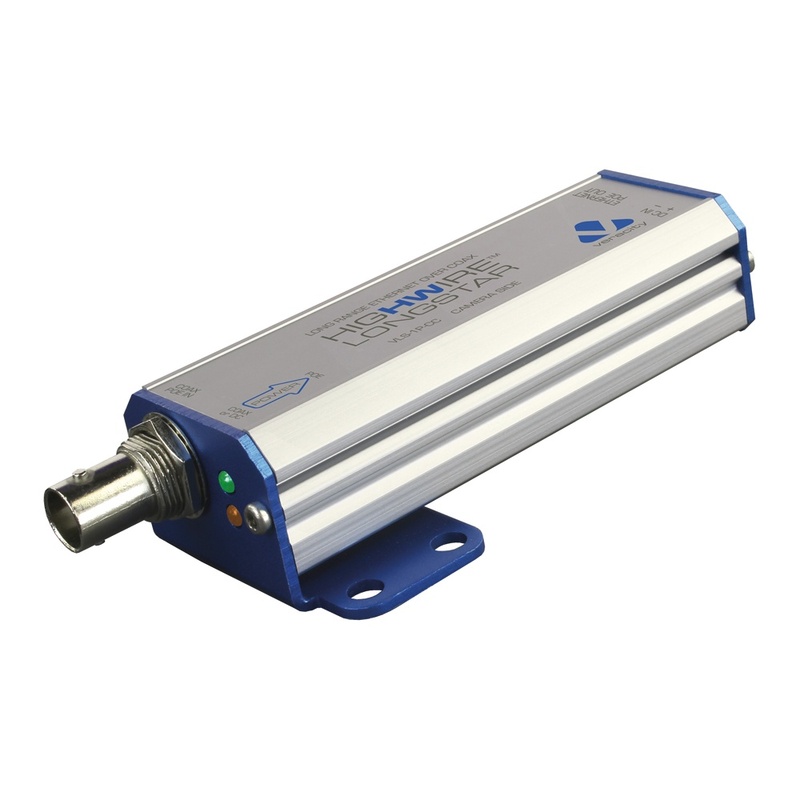 LONGSPAN can even automatically detect single twisted-pair connections and operate at 10Base-T, supporting ranges over 1000m. This is ideal for access control and other bandwidth network connectivity applications, and also, analog cameras connected with UTP baluns can be upgraded to IP without replacing existing cabling. PoE-equipped models allow power to be sourced from a single PoE switch or PoE injector, for low-cost installation and reliable UPS-backed power delivery.